Authorities suspect East Jerusalem resident knew about arsonists plan to torch hotel. Blaze critically injured family. Police arrested an East Jerusalem resident they suspect knew about an arsonist's plan to torch a Jerusalem hotel yet did not do anything to prevent the blaze that injured 8 people, Hadashot reported. The suspect, 22, lived with the man authorities say ignited the Jerusalem hotel last week. Police say the firebomber conversed with him regarding his plans in the days preceding the crime yet the suspect did not go to law enforcement. 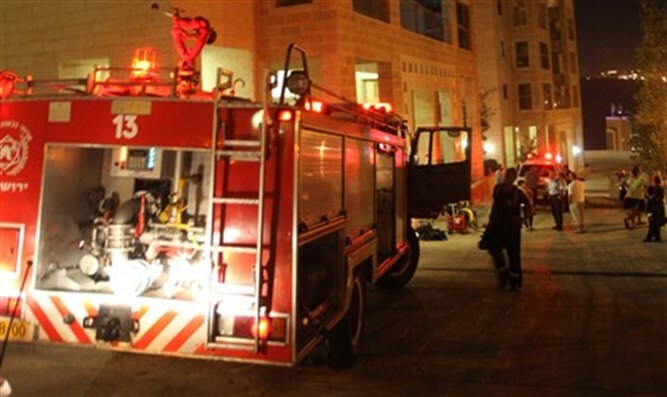 Eight people were injured in the fire that broke out in the residential building in Jerusalem. Among the injured were two parents, their 14-year-old daughter and their 9-year-old son, all of whom suffered serious injuries. They were evacuated to the Shaare Zedek Hospital in the city. In addition, one person was evacuated to the Hadassah Ein Kerem Hospital with anxiety. Three others were treated by Magen David Adom paramedics at the scene. Police say that the arsonist was an ex-employee angry about his recent firing. Firefighters also pointed a finger at hotel management, who they said did not keep the building up to the fire code and lacked proper fire-prevention measures.